Metal versus plastic is an old argument and it’s likely that you or your company have previously compared them for past projects. 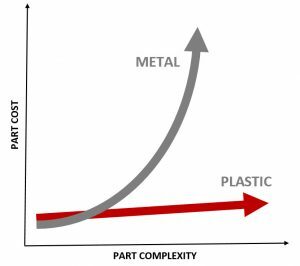 However, innovations in both plastic materials and process capabilities, coupled with changes in industry demands have closed many of the physical and cost performance gaps that once existed between metal and plastic. 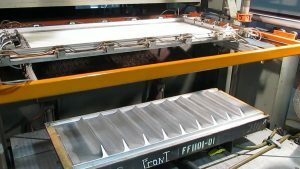 Many industries, such as aerospace, medical devices, and mass transit, are realizing the potential of the updated advantages of replacing large scale, interior, or enclosure metal parts with plastic materials and manufacturing processes, such as thermoplastic materials and the plastic thermoforming process. Heavy weight equals heavier costs. Fuel efficiency, maintenance costs, logistics, installation – all see significant cost reductions in tandem with a decreased part weight. 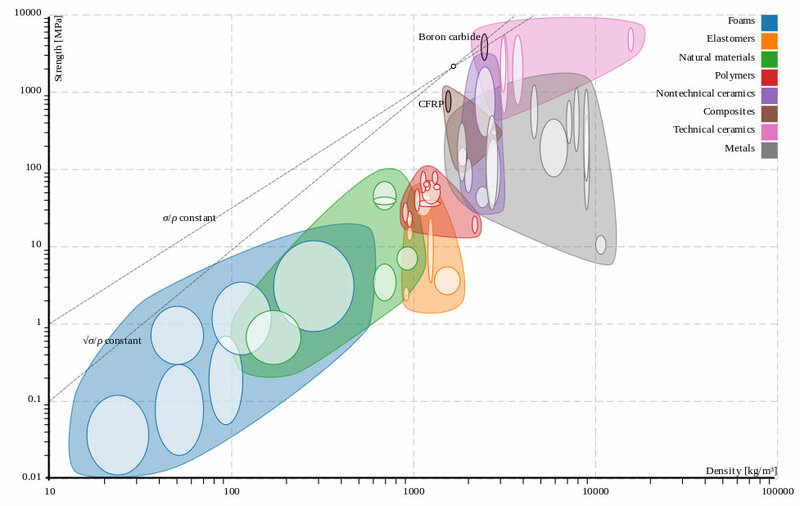 Referencing the chart below, you can see that this is a major advantage that plastic has over metal. If you were to take a part made from steel and compare it to the same part made from thermoplastic, the plastic part could be more than 6 times lighter. Take that same part, now manufactured with aluminum, and the plastic version would be approximately half the weight. The Specific Gravity – SG – is a dimensionless unit defined as the ratio of density of the material to the density of water at a specified temperature. In the past, one of the biggest roadblocks to replacing metal parts with plastic was that plastic, while much lighter, could not compete with the strength characteristics of metal. Now, with advances in plastic composites and the addition of carbon fiber or other glass fibers to plastic material formulations, thermoplastic products can perform as well as and in some cases even outperform metal in ratios such as strength-to-weight and strength-to-stiffness. Strength-to-Weight Ratio, also known as Specific Strength, is a material’s strength (force per unit area at failure) divided by its density. 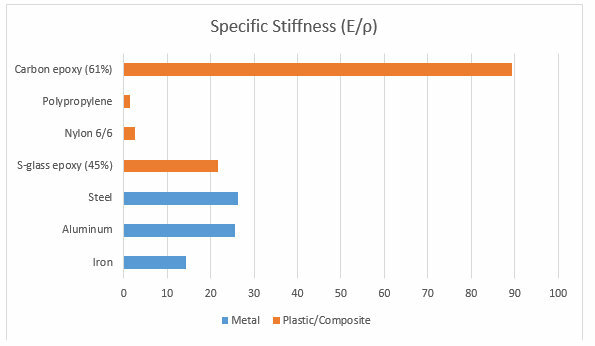 When referencing the chart below note that examples of thermoplastic reside in the composite and polymer categories and that this data may not include all thermoplastic material products, many of which are specially formulated to compete with metal and alloys in strength and stiffness. Data for these materials can be found on thermoplastic material manufacture websites. Strength-to-Stiffness Ratio, also called Specific Modulus, is a material’s property consisting of the elastic modulus per mass density of a material. Whether you’re trying to meet a deadline or fill orders for an increase in demand, time to market can be an essential factor to the success of any project. With a dramatically less labor intensive process, plastic thermoforming can save production time, energy, labor, and cost compared to manufacturing components from metal processes. You don’t have to watch the sheet metal fabrication process for very long to take away the fact that metal can difficult to work with and shape. Even with today’s technology, metal’s inherent characteristics prohibit complex part designs or shapes, such as compound curves or fluid designs from either a material capability or cost limitation. 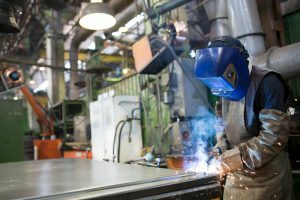 Shaping a metal part can require die work, welding, grinding, rework, or bending on each individual part produced to achieve design specifications and desired look. In addition to greatly increasing production and lead times as mentioned above, as part design complexity increases, part cost increases at an exponential rate. The same increase in part design complexity has a relatively minimal impact on the cost of a part manufactured with the plastic thermoforming process. This is because complex designs, shapes, branding, and surface textures can be incorporated directly into a part’s tooling. While this may add a slight increase in the upfront tooling cost of the part’s production, it will not add any additional secondary or shaping labor operations that would affect part cost or production time. This method and the nature of thermoplastic also offer a much larger scope of design complexity capabilities and options that are unavailable to metal manufactured parts (see Thermoforming Material Selection: 5 Ways Thermoplastic Materials Can Influence Product Appearance). Productive Plastics is a heavy gauge thermoforming custom component manufacturer, including vacuum forming and pressure forming processes. Contact us or request our complimentary thermoforming design guide for more information.